Whether you are looking for a decent website builder to start your eCommerce website or your just need the platform to launch any other type of website, you may be interested in selecting between Weebly and Squarespace. A single look at the samples of websites created with these systems gives the idea of how functional, flexible and feature-rich these platforms are. It’s close to impossible to define the leader right from the start and that’s exactly why this comparison will come in handy to millions of users worldwide looking for decent web building alternatives. Weebly – is an outstanding representative of the eCommerce industry, which can also be used to launch other project types. Founded in 2006, the system has gained worldwide recognition due to its advanced customization tools, powerful feature set and reasonable fees. The website builder was initially used as a standard website builder, but it’s undergone notable changes to be now used as a web store building system. Squarespace – is one of the most recognizable and convenient website builders, which is mostly oriented on the needs of creatives and comes with a rich feature set that is more than enough to cover a diversity of web design needs. The system works equally well for newbies and web design experts, who intend to create and manage blogs, small online stores, professional portfolios and small business websites. It’s a great choice to showcase your products and services in the most favorable light. Both website builders have much to offer to the audiences they target. All websites created with them look impressive, although, each platform has its special parameters and distinctive features. To define the unspeakable leader of the comparison, it makes sense to see what exactly each service has in stock. Today, we put Squarespace vs Weebly head to head to re-appraise their benefits and disadvantages taking into consideration their most recent updates. Weebly. There is nothing complicated, when launching websites with Weebly, no matter what web design background and expertise you’ve previously had. The system comes with a simple, understandable, logically-structured, user-friendly and well-designed interface that does not imply deep learning curve. The dashboard of the service is clear and simple as well, providing quick access to all the required information, such as website statistics, store orders, blog comments, useful guidelines etc. One of the undeniable Weebly highlights is its “box model” structure: all the content you plan to add to a certain web page is strictly subdivided into containers or boxes. To form your web page layout and structure, you should select the required boxes and drag and drop them to the page. This is how you will get a well-designed website with properly arranged content boxes with no hassle at all. Likewise, there is no need to be a coding expert to launch and manage websites with Weebly. Whether you’re connecting a domain name, changing your account access data or add another blog post, everything can be done with just a few clicks, no complex terminology, coding knowledge or sophisticated interfaces are required. Squarespace. Since the time of the last Squarespace review, the website builder has acquired the enhanced usability in terms of editing options. There is no longer the need to switch between the preview and site manager modes anymore to make and control the changes. Instead, the platform has become the WYSIWYG website builder that offers the advanced drag-and-drop feature to ensure exceptional ease of use and makes the web page editing process much simpler than before. Squarespace has an impressive suite of iOS apps and three Android applications. The iOS apps let you write and edit blog posts, manage comments, view statistics, make notes and also upload your portfolio to your mobile device. Squarespace has an Apple Watch app, too. It lets users view expanded visualization of every website metric. Weebly vs Squarespace. The systems come with logically-structured interfaces, although, Weebly seems to be more customizable: it has more opportunities to pre-edit your Page with ‘Page Layouts’ tool. Squarespace, in its turn, is a bit more complicated and it takes time to get used to its editor, especially for non-techies using the system for the first time. Weebly. The website builder is feature-laden and versatile. Being initially developed as the all-in-one system, it has recently gained a strong eCommerce focus. This happened after the acquisition of the website builder by Square in 2018. As of today, the system offers an impressive set of standard and eCommerce features that can be applied to any project. Speaking about eCommerce orientation of the system, it is chock-full of industry-specific features. These include flexible shipping options, inventory management, order and inventory tracking, integrated shopping cart, filtered product search, mobile store, coupon codes, physical/digital goods, simple and convenient product upload and management process and more. CSV file import/export is also available here to boost the efficacy of the product catalogue compilation process. Email marketing option is worth the attention as well. It helps keep your customers aware of all the business events, updates, news, special offers and other things most clients would like to know in advance. Weebly has a powerful and rapidly developing App Center. Even though, it cannot be compared to Wix App Market (which is currently considered one of the most extensive and feature-laden website builders), there are still many apps, widgets and extensions (like Live Chat, Call-Out-Box, PinPoll etc.) that can be integrated into your website on a free or paid basis to give it extra performance. This is done with a few clicks only, which is not a problem even for beginners. Weebly allows for team website management. With this purpose, you can add users and divide them into groups to control the pages they have access to. The website builder also provides a highly customizable blogging engine with full control over layout and post structure, advanced comment management tools, scheduled posting and other features. Additionally, Weebly partners with IFTTT to give users the ability to connect their favorite apps and products. Specifically, you can create so-called recipes. For example, if you post a video to your YouTube account, Weebly will automatically create a post on your blog. You can choose a ready recipe, or create your own by combining various actions and triggers. Squarespace. The website builder is full-featured, flexible and encouraging for newbies. Even though, it doesn’t offer an integrated app store or opportunity to add widgets and other apps provided by third-party designers. However, the system has a rich collection of built-in applications and widgets that help get the most out of the functionality of each website created with the service. Some of the most popular and widely-implemented add-ons and apps include widgets for photo galleries, social media buttons and eCommerce tools for websites of cafes and restaurants. With Squarespace, you can efficiently make use of integrated statistics collection tools to control your website stats and search engine positions. You can select and make use of Squarespace Metrics App or decide to integrate Google Analytics to track all the statistics changes. The website builders excel at eCommerce features as it makes it possible to present the physical/digital products in the most favorable light by launching and managing web stores. You can connect the SSL Certificate to your website to boost its security level, create alluring show windows, add/update image and video product galleries, set up and update product prices, add up to 100 various SKUs (product variations), set up payment parameters and delivery details, introduce special offers and discounts to boost customer engagement rate. 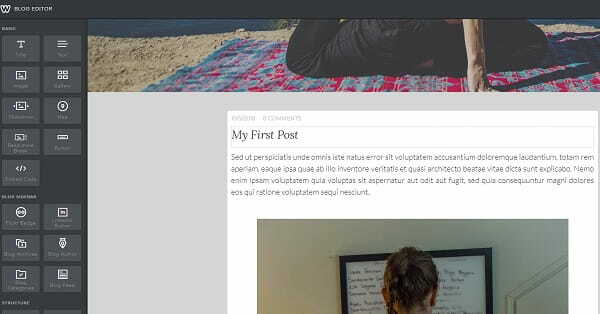 Similarly to Weebly, Squarespace has its own powerful blogging platform that supports scheduled posting and advanced comment management. Squarespace users can also give contributors selective access to the site’s control panel. SEO capabilities look a bit less extensive as compared to those offered by Weebly of Wix, for example. There are standard fields you can fill out to set up the major settings for product pages and blog sections. Unlike other systems, however, Squarespace automatically uses the product name or post headline as the web page SEO title. As a result, you cannot change it on your own afterwards. This is a small drawback for first-time system users, who are not aware of suchlike nuances. Weebly vs Squarespace. Both website builders offer decent blogging tools with flexible commenting systems, native eCommerce platforms and reliable hosting. Both let you add multiple contributors with different access levels. 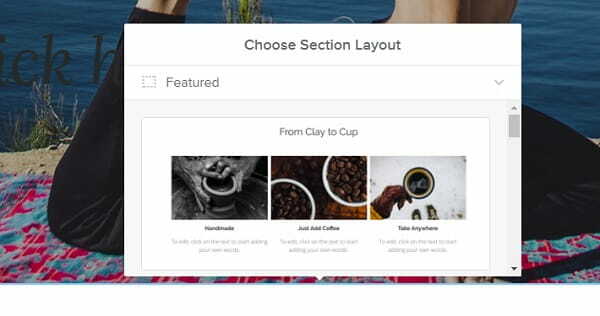 Weebly lets users customize their themes using a built-in HTML/CSS editor, while Squarespace allows changing everything from the opening doctype tag to the footer. 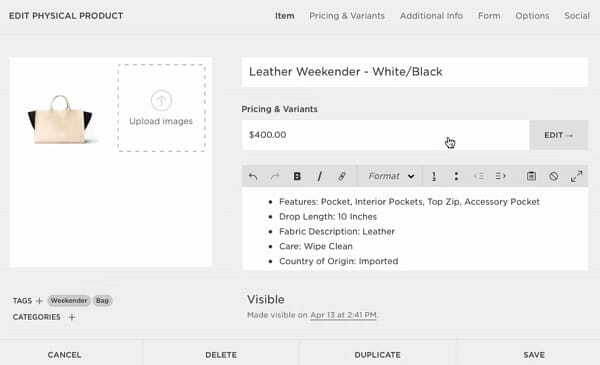 Weebly is also more eCommerce-focused, offering a wider feature set for web store creation. This is one of the major facts that make the system the leader of this comparison parameter. Weebly. The website builder notably simplifies the web development process for users based on their coding skills, degree of web design awareness and professionalism level. The system lets them choose between three web design options – customization of pre-designed themes, the use of readymade templates and personal template integration. The website builder offers over 55 templates for all tastes: from ultra-modern minimalist to classic and bold. Every template features an Advanced Theme editor that offers full HTML and CSS control for deeper customization, so nothing is out of your reach. All types of Weebly templates are responsive. Weebly has a built-in mobile editor where users can enable and fine-tune the mobile view of the site. If you want to go beyond what’s offered in the official Weebly library, you can either upload your own template or hire a developer to create a custom theme for your site. There is also a possibility to purchase a ready-made template designed specifically for Weebly – thankfully, there are many providers creating Weebly themes out there. Design customization options are numerous and versatile, indeed. See also: Weebly website examples. Squarespace. One of the highlights of the website builder is that it pays more attention to the quality of website templates developed with the system rather than to their amount. There are around 40 templates here by now, but you can be 100% sure about the quality and customizability of each theme chosen. The templates are mobile-ready and can cover any industry areas you may specialize in. These include digital stores, blogs, professional portfolios, wedding websites, restaurants and cafe websites etc. When using Squarespace, you can personally create a unique cover page for your project. Just fill out the page with the required blocks, edit the background, images, colors, fonts and other media files to give your website cover page exquisite look. This especially works great for one-page websites. Do you possess HTML/CSS basics? That can actually help you get the most out of your website design process. This feature is available in terms of the Business Plan only and lets you edit your template design by using the tools available in the dashboard. The reset option will prevent the potential problems and mistakes, contributing to outstanding result. See also: Squarespace website examples. Weebly vs Squarespace. Both website builders are great in terms of design, but Weebly themes appear more diverse. The system also provides more design customization options. Squarespace’s themes look elegant and stylish, but they’re somewhat monotonous. Weebly. Weebly is quite understandable for everyone, which does not generally pose problems. If you have any, however, the system grants access to the rich Help Center that contains answers to the most popular questions users have. There are also useful tips and how-to guides to help you get started with ease. Weebly’s control panel offers explanatory pop-up tips and prompts, which help understand the implication of this or that element. Finally, the website builder has live chat, email and phone support, which matters a lot for all users with no exception at all. Squarespace. The platform offers 24/7 email and live chat support during weekdays. The company also provides an extensive knowledge base comprised of detailed guides, videos, tutorials, articles and workshops. There’s also a community-driven Q&A forum, where you can easily find answers to hundreds of questions and take part in discussions. Squarespace vs Weebly. Both website builders care about their customers and provide various types of support. These include tutorials, FAQs, forums, knowledge base centers etc. However, Weebly seems to be a more customer-oriented system due to its live chat, email and phone support options as well as informative knowledge base. Weebly. Weebly pricing policy is a bit different from those offered by the majority of standard website builders. This is mainly because of the system’s approach to the price formation aspect. The system has two types of plans developed for ordinary websites and online stores. The pricing table for ordinary websites encompasses five plans, ranging from the free subscription needed to test the feature set of the system and up to $25/mo (with one-time yearly payment) for the most expensive Business Plan. Speaking about online stores, Weebly also offers 4 plans. The cost of the plans starts with $8/mo and reaches $38/mo (with one-time yearly payment) for the exclusive Performance Plan targeted on experienced entrepreneurs. Squarespace. Unlike the majority of its renowned competitors, Squarespace doesn’t follow the freemium model. It has no free packages, yet it offers a free 14-day trial to get used to the system and explore its feature set. No credit card data or personal info are needed to sign up for a trial. Additionally, there are four paid plans divided into two groups with discounted yearly subscriptions. Their prices range from $12/mo and up to $40/mo based on the amount of products you’re going to sell and eCommerce add-ons. Weebly vs Squarespace. The obvious benefit of Weebly is that it has a free plan that never expires and lets you publish a simple ad-free site under your own domain name at just $8/mo, while the cheapest version of the full-blown Squarespace website starts from $12/mo. Weebly also offers separate subscription packages for standard and eCommerce websites. This is also appreciated by many users. So which one is better – Weebly or Squarespace? Both website builders offer a broad range of features and tools needed to solve various web design tasks. It’s difficult to call any of these services an obvious leader right from the start as each system has much to offer to contemporary users and applies powerful feature sets for the completion of various web design tasks. 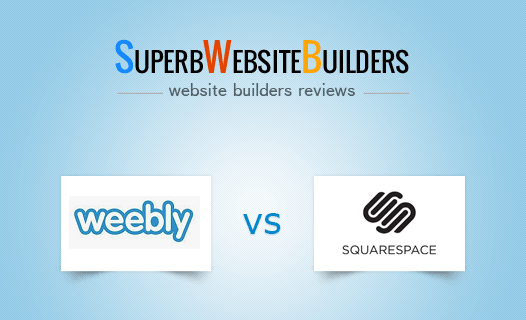 The detailed review and comparison of both services helped us decide that Weebly somewhat prevails over Squarespace in terms of its feature set, web design customization options and pricing policy formation approach. Weebly is a website builder, the sphere of application of which has gone far beyond standard use. The system is now considered a quality eCommerce website builder, with a feature set being oriented on this niche. Squarespace is a worthy website builder that initially works nice for the representatives of creative professions and small business owners. It allows highlighting the pros of products offered in website show windows, displaying their powerful characteristics to the advantage. Weebly looks more favorable than Squarespace to those who want to create websites easily and in a short time. We think it would be better to take a note on Weebly, as it gives much more opportunities for your future website. If you still have doubts, take your time to test both systems to define your own winner or just test Wix that can be a perfect alternative to any of these website builders.